“Uthark” refers to the theories of Sigurd Agrell (1881-1937) who theorized that there was an exoteric and an esoteric rune row. The first stats with the F-rune, in the second, this F-rune is placed at the end. To this he connected numerological and esoteric explanations that Karlsson finds convincing enough to create a magical handbook based on the system. This has a bit too much of a ‘Flowers-feeling’ to me. Then we continue to the part about Bureus, his “Adulruna” and “Gothicism” before and after Bureus. I have spoken about that in my review of the German translation of the book. Karlsson’s latest makes a nice read. 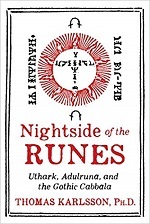 There is a bit too much of Runegild / Dragon Rouge contemporary magic in it for my liking, but it is great that there is finally descent information in English on the esoteric rune systems of two little-known Swedes. Also Karlsson shows Bureus’ path as an individual path of progress and describes the initiatory system of the Manhemsförbundet, so you get ‘old an new’ practical Runosophy.